Well it's that time of year again, when the old year is on the way out and the new year is ushered in with all kinds of celebrations or hardly being noticed. Some people will go out to clubs or bars to party. Some people will go to parties at friends' houses and some will watch the New Year come in on TV. Others won't pay a bit of attention to the event and go to bed early. As per custom nearly everyone makes a New Year's resolution, which is usually broken within days. At the gym on January 2nd, the place is packed with dieters who have resolved to lose weight. By February 2nd they're nowhere to be seen. People quit smoking, at least for a couple of days and people give up alcohol, until the hangover of New Year's Eve wears off. People wish each other a Happy New Year and offer hopes of a better year ahead. People hope for a better economy, more jobs, less violence, less suffering and world peace. People offer well meaning and heartfelt intentions to make life easier for everyone. But unfortunately not everyone hopes and prays for the betterment of the lives of all. There will still be people who will work hard to deny some people of their rights and push to impose their beliefs on others. There will still be people who will try protect the wealthy, at the expense of the poor and middle class. There still will be bigots and racists who will spread their hate. There still will be terrorism in the world and their still will be gun violence in our country. The divide between the Republicans and Democrats will remain, as the GOP will keep trying to discredit Obama. Nothing will change until our politicians have the balls to stand up to the extremists in this country and bring about change. I guess that as the New year approaches I remain a bit cynical and jaded, by the events of the past year, including the presidential election and the recent school shootings, with the pathetic behavior of the NRA and others. I see the fiscal cliff coming in just a couple of days and I see the House Republicans ready to let the country go over the cliff to protect the top 2% wealthiest Americans from paying a dime more taxes.They are willing to let the poor and middle class suffer and perhaps lose their jobs so the wealthy don't have to pay their fair share. Well enough of the depression of the past. We all must hope for the best and work hard for the betterment of ourselves and others. We can't let the extremists in our society define what America is. So in that spirit I wish everyone reading this a very Happy, Prosperous, Healthy and Loving New Year. 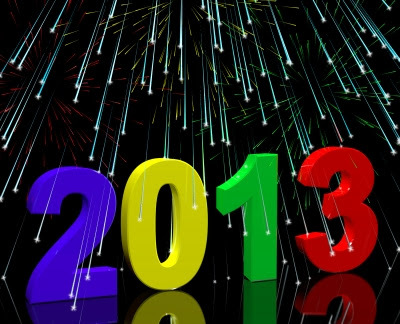 We CAN make 2013 a better year.